Two banners, one reading “Save This Factory” and the other “Save American Jobs,” hang off J.C. Newman's El Reloj factory as part of its Save Cigar City campaign. In an effort to halt the FDA’s regulation of the premium cigar industry, the J.C. Newman Cigar Company of Tampa, Florida, is relaunching its Save Cigar City campaign. Brothers Eric and Bobby Newman, alongside U.S. Rep. Kathy Castor (D-Florida), stood inside the historic El Reloj cigar factory this afternoon and encouraged the public to submit a comment to the FDA asking the agency to spare family-owned cigar factories from burdensome government regulation. The U.S. Food and Drug Administration opened a commenting period in March after the agency announced it would reconsider its regulatory overhaul of the premium cigar industry. The Newman family, hoping to spread the word, has set up SaveCigarCity.com, which provides suggested wording and a link to the FDA’s website. The FDA’s commenting period is open until June 25. J.C. Newman originally launched its Save Cigar City campaign in 2014, when the FDA first considered regulating premium cigars. The grassroots campaign, however, was ultimately unsuccessful. The agency announced it would take regulatory control over the premium cigar industry in 2016. The overhaul of the premium cigar sector—which requires family-owned cigar companies to pay the same user fees and abide by the same sales restrictions as large tobacco corporations—is now slowly going into effect. 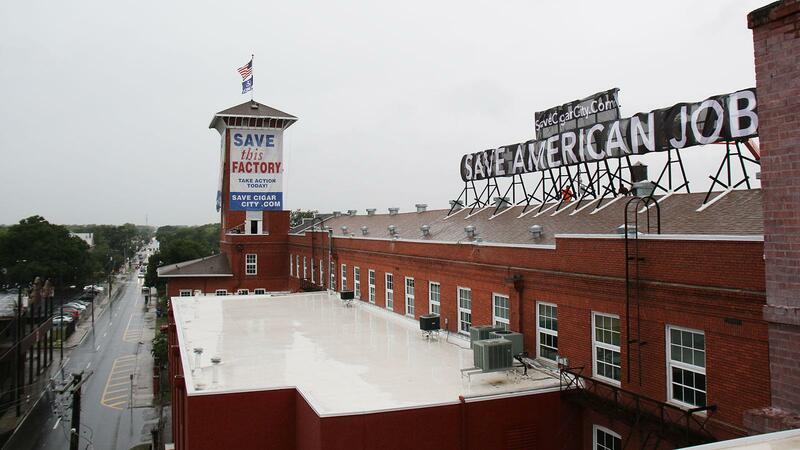 In an effort to raise awareness, J.C. Newman has also hung a banner that reads “Save This Factory” over the building’s namesake clock tower and a “Save American Jobs” banner on its neon sign. Efforts by the cigar industry and its lobbying organizations have been successful in getting the attention of lawmakers. Drew Newman, Eric’s son and general counsel for J.C. Newman Cigar Co., expressed gratitude towards Rep. Castor, who spoke at today’s press conference, as well as the congressmen who have introduced legislation that seeks to exempt premium cigars. According to the Newmans, FDA regulation would cost their company an estimated $30 million per year, amounting to three times the factory’s annual gross sales.